SEO is essential to create discoverable content that your readers can find on Google, Bing, Yahoo, or even Duck Duck Go. SEO can become quite complicated and intimidating for the average user. 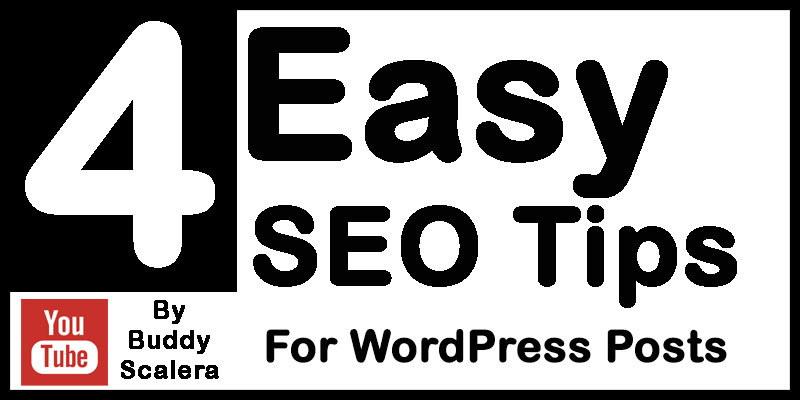 So here are four easy SEO tips for non-technical people using WordPress for a blog or website. In this Marketing Tech Tip, we’re going look at four quick and easy tips to optimize your WordPress blog post for search engine visibility. Coding skills or special technical capabilities are not required for these simple tricks. In less than 10 minutes, you can increase the search engine optimization (SEO) of any WordPress blog post. Search engines like Google give a lot of weight to the title tag, so include your most important keywords in your title. Also, because Titles can get cut off, you should move important information to the left. If your title gets cut off, readers will still know what your post is about. Like the title, you should include your important keywords in the URL. You can edit and customize the name of your URL, which also gives your readers information about your content, if they share it with a friend. Google may not be able read your image, especially if it has design or branding. You can add a Description, a Caption, and even an alt tag to help search engines to understand this important visual content on your post. When you upload your image, WordPress will prompt you for most of these fields, but you can also update them in the actual post. If you’re interested in learning more about optimizing your metatags, be sure to check out the other videos on my channel about how to add metatags to the actual image. Google will try to pick up a relevant description for the results page, including the title tag and a meta description tag. If you were building your site in HTML, you’d go into the code or your web design software to update this information. WordPress makes it even easier. There is a field that allows you to populate a brief description. It is important to mention that the character counts for meta description tags has changed over the years. On desktop browsers, Google will display additional characters. In some cases you can fit up to 300 characters. However, you have to consider the mobile screen as well. To be safe and mobile friendly, I generally try to limit my meta description to about 155 characters. If you need a quick way to review the character count of your content, you can just open a Google Doc. Under the Tools menu, you can get a character count. So that’s it. Four quick and easy tips to help you optimize your WordPress post. There are many other options, including free and premium plugins. If you’re just getting started with WordPress, I’d suggest trying these techniques on your next blog post. And, yes, you can go back to update older blog posts. Certain advanced optimization techniques will benefit from free and premium plugins like Yoast and Jetpack, but those can be a little challenging for new WordPress users. I do recommend that you check them out, if you decide that you need an extra boost to get your content out there. This entry was posted in Marketing, Marketing Tech Tip, SEO, visual content marketing, visual content strategy, YouTube and tagged Search Engine Marketing, SEO, visual content, wordpress by Buddy_Scalera. Bookmark the permalink.